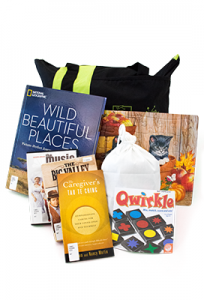 Caregiver Kits to Check out and Take Home! Being a care-partner for someone with dementia is a lovingly heartbreaking journey. I know this from experience. I also know there are days when you run low on energy and resources. This is why we designed 15 unique caregiver kits people can check out and have at home to entertain and have a bit of a respite. You can check out a caregiver kit, or stop by Koelbel Library and ask to speak with one of the senior librarians. We will be glad to help!